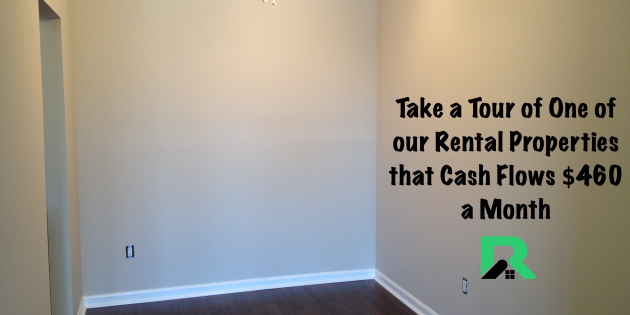 Take a Tour of Our Rental Property that Cash Flows $460 a Month. We recently had tenants move out of one of our rental properties. In the midst of taking account of what needed fixed and/or updated before we rented it out again, we took a tour of it so that you could see a realistic rental property. When the previous tenants moved out we had the property rented out within 10 days. It was a quick turn around and we only had to complete some minor fixes to the property: touch up paint, replace a light fixture, and get it professionally cleaned. Take a walk through our property with baby Molly and me! Hi Emily: Great video (and I cannot believe you did with a baby around your neck…literally!). btw, the sound cuts out at 3:50. Just a couple of questions: What’s the square footage of the property? Does it come with a garage? I guess I am trying to figure out what the $1000 rent gets in your area. Of course my area might vary completely… but just as a comp. Thanks for your kind words! The square footage for that property is 1,162 and it does not have a garage. What area are you looking to invest in? Hi Emily – thanks for the quick reply. I am thinking in Kansas City area. Still researching the rental comps though. Need to hit a sweet spot in my cash flow.